Have one or know of someone who does? Mine ate itself last weekend and looking for a new one. R&P only or complete diff is good with me. I'm running 5.13s in mine currently. They make 4.88s for them too. I cant tell from the photo but is your diff an NA or T2? Have to run the NA diff in EP. I have a 4.30 but use the 4.88 for shorter tracks (Jerico gear box). A 4.77 would also work and I talked to the guy that makes the 4.77 for Mazdatrix but would prefer one complete and ready to go. There's got to be a few laying around and they are not as popular as the 5.12. I was in a similar situation last year. Had a busted 5.12, so I put my old 4.10 in the car. I spent a significant amount of time looking for another 5.12 or a 4.88. I never did find one. I finally ordered a 4.857 R&P from Mazda Motorsports (MP01‐27‐110, $458) for the SCCA runoffs (Oct) but they were backordered and it didn't arrive in time - I think I finally received it in February. I'm planning to have Mazdatrix put a diff together for me with it. I'll watch this thread and hope you have better luck. Interesting you are all having so much trouble finding this. The FC diff is the same R&P specs as the FB correct? I run an 84 and I got my 4.77 R&P out of the front axel of a kia sportage... If I recall I don't think I paid more than 150 bucks for the whole diff. and there were tons to be had on ebay. 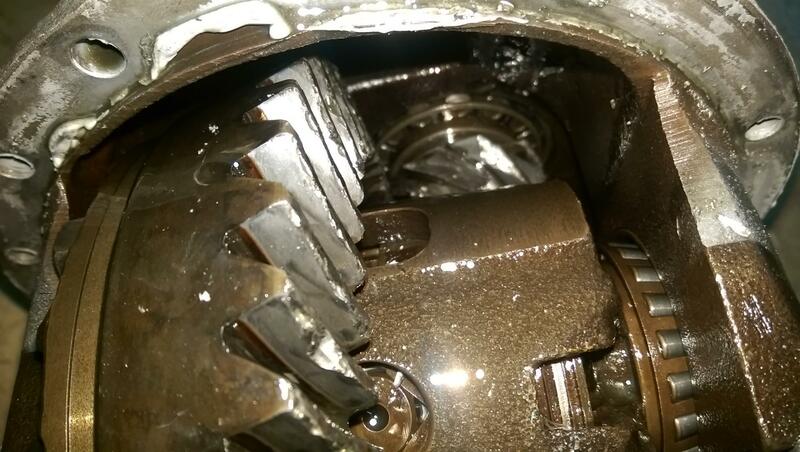 The FC diff has a longer pinion than the FB.. so the gear has to be grafted on to a FC pinion shaft. I have one, been waiting for 2 days for the 2nd generation for sale mods to approve my thread. 4.88 speedsource rear end set up by Trembly, Miata torsen diff, 1500 miles, all you have to do is bolt the housing together and install the subshafts (which I have all of it). Unless you are running a 1st gen or miata full 3rd member somehow that part number wont fit a 2nd gen diff....it's the short pinion version. You will have to have mazdatrix extend it. Isnt it a common mod for FD guys to put TII diffs into the FD's ?? why cant it be done visa versa , take an FD Diff with the RX8 ring and pinion , and than put it into an FC? Because the pinion in the FC is much longer. The gear sets are not interchangeable. The differential itself is interchangeable between TII, FD and RX-8. But only the carrier, not the gears. Correct. They've got a shop they sub out to for the modification. How much was he going to charge to extend a pinion? Because that sounds kind of like a viable option(extend rx8 4.44 for fc tii). Wish I would have logged on the site sooner. Just saw you sold it and I would have bought it for your asking price. I know the guy you are referring to and spoke to him a couple months back after mine broke and he recommends using new Kia gear sets as they are relatively cheap and worth the extra $100 or so over used. If I recall he was about $600 labor for the pinion modification. He also does them for Mazdatrix. I"m going to keep looking for used. Still looking, prefer a clutch type 4.88 LSD but would consider Torsen for the right price. Anyone have any better gears for sale other than the standard gears for a FC turboII diff? Quick Reply: Any 4.88 2nd Gen Diffs Left?